We recently travelled from Ottawa to the Island of Oahu, Hawaii with our three kids aged, 11, 7 and 4. It was an amazing trip and I wanted to share some highlights and tips to make your trip to Hawaii memorable if you are travelling to Hawaii in the near future with kids. Ottawa to Hawaii – is a long flight that we really underestimated at first due to the time difference. We chose to fly to Hawaii on United Airlines and I came away really disappointed with the service given the long flight. Their internet service didn’t work the entire flight – so even though we downloaded the United App we couldn’t access any inflight entertainment. The food ran out in-flight (I got the last pasta dish and I paid dearly for it!) and our quarters were cramped in economy. Throw in 3 kids with all of the lack of amenities and it made for a challenging flight. We carried what I thought was boatloads of food on our flight to satisfy three kids on a long haul flight – that also ran out too! Tip: Plan wisely and pack more snacks than you need. If there are any flight delays then you will need any extras for the longer hours in the airport. Hawaii is an expensive destination – and so even if there are leftovers – you will have extras for the following day. Luckily, once we landed in Hawaii, things got much better. Our hotel – the Hilton Hawaiian Village, the largest resort in Hawaii, turned out to be a blessing for the entire family. The first night we got there (Friday night) we were lucky enough to catch the friday night fireworks on the beach! The Hilton Hawaiian Village – is just that – its a self-contained village with all the amenities you need without even having to leave the hotel. It has over 90 shops, 20 restaurants and bars, six swimming pools, a lagoon, a kids club and too many other amenities to mention. We didn’t get to see even half the resort even though we did a seven-night stay. Above: The boys at a waterfall at Hilton Hawaiian Village. Photo: Blair Global Media. Below: View from our hotel room at the Hilton Hawaiian Village. Courtesy of Blair Global Media. The hotel is also ideally located close to several attractions and restaurants and eventhough we rented a car for the entire week, we could walk off the resort for breakfast at Wailana Coffee House (for good breakfast deals), for shopping at the Ala Moana mall (which I highly recommend) and to get souvenirs and general purpose items at the local ABC Store – I brought home teas of every tropical flavour possible – from pineapple to mango! and also brought back the famous coconut flavoured syrup. We stayed in a two-bedroom suite on the Grand Waikikian Tower, ideal for large families with more than 2 kids! The suite was huge, with flat screen TVs in every bedroom, two and a half bathrooms and a full kitchen. Of the restaurants at the hotel – we got to sample Lappert’s Ice cream – which the kids loved – those scoops should be banned! They are huge! The flavours are authentic – when they say coconut they mean it – no fake flavours there. The smell of the waffle cones permeated the entire resort, even into your hotel room, good job Lappert’s – no more marketing needed! Ofcourse, my oldest son kept asking to go there each and every day of our seven-night stay. We also ordered pizza from Round Table Pizza – which was ideal for nights we wanted to just eat in after a long day touring. On our last night we sampled Benihana – our kids loved the experience of having that personalized service and having the meal prepared right at our table. The Polynesian Cultural Centre was truly a rich experience for the kids. Visitors can explore authentic villages from 6 Pacific cultures as they demonstrate their arts, music, history and games. Photo: Learning how to twirl a baton from a fire dancer. First a baton twirler, then a fire-eater. Photo courtesy of Blair Global Media. Waterfalls at Polynesian Cultural Centre. Photo courtesy of Blair Global Media. 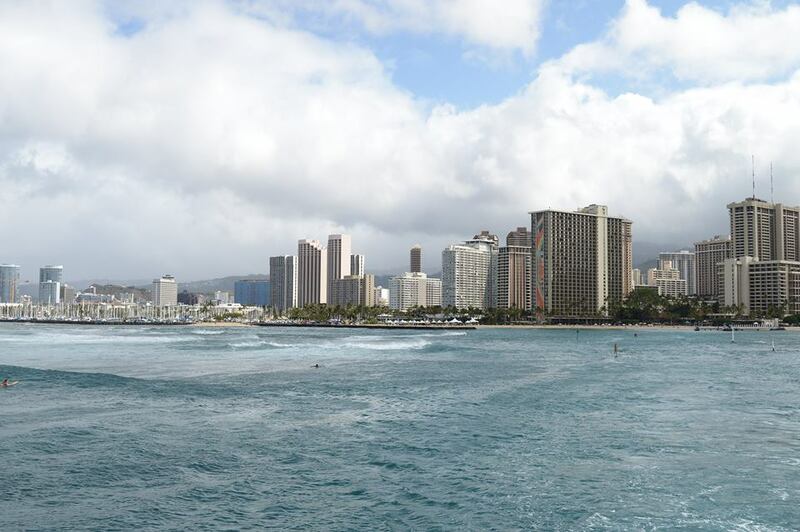 For many, a trip to Honolulu, Hawaii, is not complete without visiting Pearl Harbor. In fact, this site is recognized as Hawaii’s top tourist destination, with millions of people visiting each and every day to soak in a bit of history and pay their respects at the USS Arizona Memorial. Located a handful of miles west of the city of Honolulu, Pearl Harbor serves as the home of the U.S. Navy’s Pacific Fleet. When the Japanese attacked on an otherwise peaceful Sunday morning in early December 1941, they caught the base completely off-guard. The attack — which came in two waves beginning just before 8 a.m. local time — lasted approximately two hours. Over 3,500 Americans were killed or wounded that morning, including 1,177 who went down to watery graves when the USS Arizona exploded and then sank in the shallow harbor. 350 aircraft were destroyed or damaged, but luckily the aircraft carriers that were based at Pearl Harbor were not around that morning, and therefore suffered no damage. 21 vessels were sunk or badly damaged, including all 8 battleships of the U.S. Pacific Fleet. The USS Arizona and USS Utah still sit at the bottom of the harbor. Wear Running Shoes: the visit includes lots of walking and climbing – leave the flip-flops for the beach. If you’re going with an infant or child younger than 6 – I would recommend a small umbrella stroller for the day. Our 4 yr old couldn’t handle the walking and after a while she became fussy. Bring Sunscreen: For some reason it seemed like the sun was the hottest the day we visited Pearl Harbour. The Atlantis Submarine Tour was another highlight of the trip. With Atlantis Submarines, you explore depths of Hawaii’s ocean waters 100 feet below the surface and “swim” amidst schools of beautiful fish in the world’s most technologically advanced passenger submarine. We were able to view sunken ship wrecks and airplanes at a depth of more than 100 feet and learn about coral, reef life and submersibles through audio headsets with narration in several languages. Kualoa means “long ancestral background” in the Hawaiian language, a fitting tribute to the area’s interesting history. In the old Hawaii, chiefs brought their children here to learn learn about their heritage and traditions. The park itself was once a sacred town. Today, the park is listed on the National Register of Historic Places. Kualoa is a 4000-acre private nature reserve and working cattle ranch, as well as a popular tourist attraction and filming location on the windward coast of Oʻahu in Hawaiʻi. It is located about 24 miles from Honolulu, and 32 miles from Haleiwa. In Jurassic Park, the rolling green landscape where Alan Grant and the kids find themselves in the path of a herd of Gallimimus fleeing from the T Rex, is one of the best attractions in Oahu. The stampede in the film was filmed at the Kualoa Ranch, Kamehameha Highway, Ka’a’awa Valley. The ranch is open to visitors, and the fallen tree, under which Grant and the kids take shelter, is still there as a great photo opportunity. There’s a one-hour location tour, which takes in sites from the 1998 Godzilla, Windtalkers, 50 First Dates and TV series Lost. Take Kamehameha Highway north from Honolulu, about 20 miles. The entrance is on the left, opposite the Kualoa Regional Park. The Disney Aulani Resort is truly spectacular and it is breathtaking! and yes its totally worth the cost! We wavered between staying at the Hilton Hawaiian Resort and Disney Aulani – in the end we enjoyed the best of the two resorts. If you can’t figure out which hotel to choose – I would recommend splitting your stay between both resorts as the two have so much to offer and they are located in different parts of the island. Aulani’s natural surroundings in Ko-Olina are beautiful and the kids loved being there for the day. Auntie’s beach house, a 5,200 square-foot, kids club was amazing – the kids didn’t want to leave! There are so many things to do that it’s hard to decide what to do first at Aulani. The grottos, lazy river, keiki splash zone, snorkeling lagoon and beach keep everyone entertained, no matter what the age, and the appearance of Disney characters on the resort grounds each day adds an additional layer of fun to staying here. When we visited Aulani they had a beach party that day – and I kid you not – all the Disney characters were present and everyone had a ball! Hotel and Lovely Lazy River at the Disney Aulani Resort. Photos Courtesy of Blair Global Media. (Above) Lagoon at Disney Aulani Resort. Photo courtesy of Blair Global Media. (Below) Shake-A-Shaka Pool Party dance-off at Disney Aulani. Photos Courtesy of Blair Global Media. When we visited Aulani, it was also our anniversary and we had lunch at ‘AMA‘AMA. The restaurant is named after the ‘AMA‘AMA, a local mullet fish—and it’s inspired by the fishing settlements along the leeward coast of O‘ahu that date back to the 12th century. ‘AMA‘AMA is designed to resemble a beachside house. Its spacious dining room features a thatched roof, mosaic designs, a fountain and a reflecting pool. When they realized it was our anniversary – we were presented with a tasty gift! The serving sizes at ‘AMA‘AMA were huge – hubby had this burger for lunch and I don’t think he finished it! We also had dinner at Makahiki restaurant, a casual, family-friendly restaurant named for the Makahiki season, the traditional Hawaiian celebration of the harvest. Throughout the restaurant, you’ll find elegant glass designs and jewel-toned murals that depict the story of the Makahiki season. The buffet was delightful and had a good selection of kid-friendly treats. The Ala Moana was always abuzz with live entertainment and has a food court that is large and has a diverse selection of food. We frequented the Ala Moana because we couldn’t get enough of the vibe. The Ala Moana Center is the largest shopping mall in Hawaii, with 310 stores. It is ranked the second most profitable mall in America and is located in Honolulu just minutes from Waikiki, in an open-air shopping oasis. The Ala Moana Center currently features more than 80 dining options, and one of the largest collections of luxury retailers in the world, four major department stores (Macy’s, Neiman Marcus, Nordstrom and Sears) and several only in Hawaii retailers featuring locally-made products. Have you visited Hawaii with kids! Share your tips by posting a comment below.